Source: Molyneux-Seel Collection with permission of the Lancashire Record Office. The dossier is an extraordinary and odd compilation of miscellaneous information and misinformation (see note 1 below). The above tree is especially odd, though it is less so at the bottom with Emanuel the 2nd English Duke shown as the trunk. His parents are correctly shown as Isaac and Lydia (originally Leah). Lydia's parents are shown as Isaac and Julia (in real life she was Judith). Isaac (the father) descends from the Don Manuel/Emma (ie Emanuel/Esther) marriage. 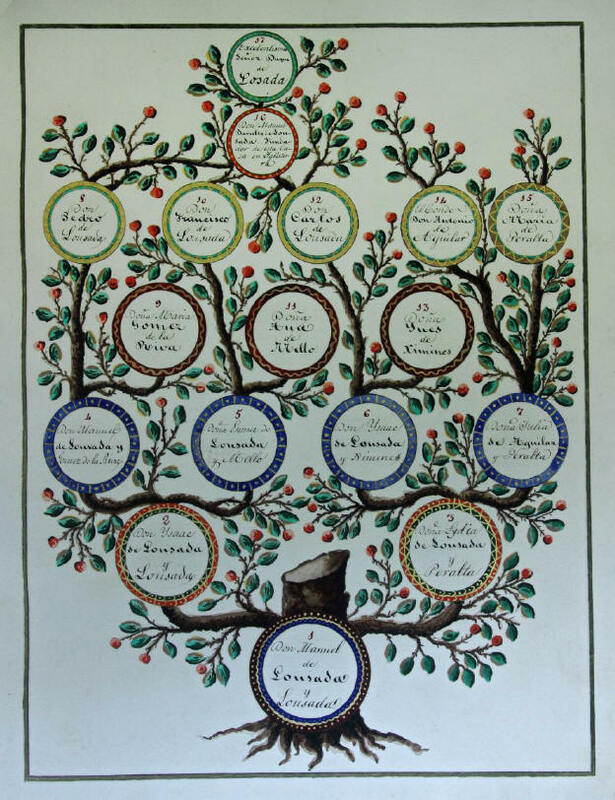 All this is an slightly restated replica of the known Lousada genealogy with some extra surnames added and some Jewish signs removed - marriage of cousins, Judith now Julia, Esther now Emma, Emanuel now Manuel, but most interestingly Judith's father the remarkable and openly-Jewish Baron Moses d'Aguilar of the Austro-Hungarian Empire is shown as Don Antonio and his title is upgraded to Count! An obvious problem in this tree concerns Don Manuel, given the number 16 above, who is stated to be the founder of the English House - who it will be noted descends directly from the Duque de Losada. This Don Manuel (no doubt) signifies Emanuel #41. Of course Emanuel #41 cannot descend directly from the Duque de Losada - Emanuel was born in 1682 well before the (childless) Duque who was born in 1706! Isaac #92 and Emanuel #93 must have realized this biological double impossibility after the tree was (beautifully and no doubt expensively) drawn up, for later authors adjusted the story in variously describing the Duque as cousin of Emanuel #41 (Ruvigny), as kinsman of Emanuel #135 in our Burke's Peerage extract and even as Emanuel #135 himself (ref 164)! Unfortunately, these interpretations are all incorrect as indeed is the botanically-odd tree itself - for it grows from the leaves down! A large element of fiction enters the tree in line 3 (but see note 4 below). In real life Emanuel #41 had two sons - Aaron #125 of Jamaica and Jacob #36 who went to London. Jacob was the father of both Esther (who married the second Emanuel of Jamaica ie Emanuel #135), Isaac (who married Judith d'Aguilar), and Emanuel #87 whom Ruvigny recognizes as obtaining a grant of arms, while Aaron was the father of the Emanuel #135. However those two sons Aaron and Jacob are replaced by three fictitious sons - Pedro, Francisco and Carlos - to whom the descent of Emanuel, Esther and Isaac is respectively attributed. Why this substitution was done is a mystery - but see note 2 below. Emanuel #41 was the youngest of 4 sons all born in Barbados, which raises a major complication (see note 3 below). Any link with the Duque must have come through Emanuel's father Aaron who left Livorno for Barbados before 1659 and Emanuel's grandfather Isaac who left Iberia for Livorno before 1640. No attempt to bridge this gap has been found - and no wonder since it would have to deal with the Duque's immediate family, including his brother Don Sancho whose descendants made claims for the title in 1969 and 1915. There is thus no proven link between Emanuel #93 and the Duque de Losada but if there was any it would have been many generations earlier than the Duque's own relatives. There is nothing in the papers left by the 2nd Duke to give us reason to believe anything other than that the 5 Lousada Dukes with expensive assistance unofficially started using the title (see note 5 below). If the above tree is looked at with a psychologist's eye, the key player was the 2nd Duke Emanuel #93 who appears to have led the way by promoting his own father the 1st Duke Isaac #92. The dossier (including the above chart) was expensively produced, and the Burke's Peerage entry was not cheap for around 1870 Emanuel paid £50 to Sir Edmund Burke. The dossier appears to contain the names of some of the Spanish heralds and genealogists involved, but the name of another appears in ref 164. Note 6 below shows that Wilfred Samuel had similar thoughts some decades ago. 1. In it can be found reference to Julius Caesar and Greece. The latter may constitute a hint that some of the Lousada ancestors went to Salonika after 1492 as many Sephardim did, but this we have not followed up as so far our enquiries have led us only to Livorno and Villaflor. 2. Perhaps 'Francisco' is intended to echo the name of Francis(co) de Losada d1610 who is referred to in Burke's Peerage but who like the Duque has no proven link to the Baruch Lousadas. 3. As Emanuel #41 was the youngest brother, a claim that he succeeded the Duque must examine how the other 3 older brothers David #612, Solomon #712 and Jacob #380 were bypassed. This was not done in the dossier, but interestingly if it had been done it would have found that Emanuel #41 had the longest surviving male-line descendants and once the male line descending from Isaac #92 ceased, the male descendants of Isaac #68 who married Sarah the daughter of Isaac the 1st Lousada Duke would have been inherited the title, and once the legitimate male line descendants of Isaac #68 were no longer with us, then next in line would be the male line descendants of Howel Arthur Lousada #28 and then Reginald Robert Lousada #29. 4. This line of the chart contains 4 names which are reflected in those given to the first 4 sons of Air Commodore Charles Rochford Lousada #482. The oldest son's name reflects the name Antonio given above to Baron Moses d'Aguilar aka Diego Lopes Pereira and the next 3 sons have names reflecting the 3 fictitious sons. This naming is all probably coincidental, and not a reminder that the history of the Lousada Dukes is a treasured part of family history! Of course it is hard not to admire their audacity in seeking high Iberian status to reflect that which the family once had - going back to the Curiel link and perhaps even before 1492. 5. Thus there is no record of the payment of fees due upon any of the 5 purported title successions, and indeed there are no Spanish or Italian title documents left by the 2nd Lousada Duke.